For those looking to explore the local area you will find some interesting and beautiful places to explore and fun things to do. Oban, the Seafood Capital of Scotland is a popular coastal and historic town and is 29 miles from the cabin. It is bristling with things to see and do; including the nearby Scottish Sea Life Sanctuary. Taynuilt village is 14 miles from the cabin and hosts a number of interesting attractions including; Inverawe Smokery and Country Park, Loch Etive cruises and Bonawe Furnace. Kilmartin House Museum is an award winning world-class centre for archaeology. It is an exceptional centre devoted to one of Scotland's richest prehistoric landscapes. Well worth a visit! This beautiful and historical Scottish town enjoys a picturesque setting on the shores of Loch Fyne and offers some excellent local attractions and places to eat and shop including; Inveraray Castle, Inveraray Jail, Inveraray Maritime Experience, Auchindrain Township, the world's most respected Scotch Whisky Shop, The George Hotel and Loch Fyne Oyster Bar. 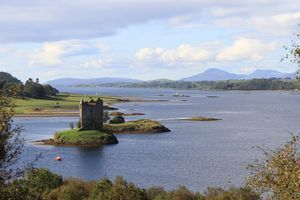 The local area is bursting with castles including Dunstaffnage Castle, a 13th century castle where Flora McDonald was a prisoner, the beautiful St Conan's Kirk and Kilchurn Castle the most attractive and photographed castle in Scotland. Gardens range from informal woodland gardens to classic examples of 18th century design. For something historic visit Ardchattan Priory and Gardens. It was here that the last Gaelic speaking Scottish Parliament was held in 1308. The cabin can be a great base for exploring the West Coast Islands of Scotland. A day trip to Mull is very popular. The cabin is ideally located for those wishing to go on The Seafood Trail, a meandering route through some of the most spectacular coastal scenery Scotland has to offer and will enable you to sample, share and enjoy seafood and shellfish from a wide variety of waterfront establishments including; Tayvallich Inn in Tayvallich, The Cairnbaan Hotel and The Crinan Hotel on the Crinan Canal and The Pierhouse Hotel at the stunning Port Appin, to name just a few! You can also attend Highland Games which are held throughout the summer in towns throughout Argyll. Check out outdoor and sporting activities for those seeking more of an adventure.